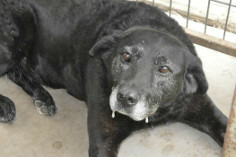 Thursday promises to be a beautiful day at the rural Chautauqua County Animal Shelter in Sedan, Kansas, as the senior black Labrador retriever, referred to as Ma Kettle, is being prepared to fly on a private jet to her new home in Tampa, Florida this afternoon. And here is the Cinderella story of a rejected dog going from rags to riches, as Ma Kettle (whose real name happens to be Lady) travels by car 40 miles to the Independence Airport to await her magic chariot ride to a well-deserved life of pampering and love. Just a few days ago, Lady just wanted to go home; she had escaped from the yard of her latest adoptive home and walked the 30 miles to her original home, but her former owners wouldn't agree to take her back. Poor Lady ended up at the shelter again; a place where she had been just a few years ago when her owner died.